Stretching 6000km in a dotted line across China, the Great Wall was begun in the 5th Century BC. As it snakes across the mountains it conjures up a sense of history which is difficult to grasp until you have had the opportunity to experience it. 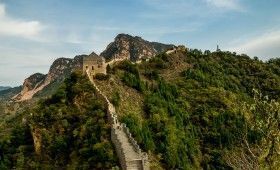 Our trek is very varied, as we pass through woodland and terraced farmland, and follow the contours of the beautiful hills and mountains in remote areas north of Beijing. We follow old sections of the Great Wall, as well as restored sections with smooth flagstones and lots of steps! This challenge is physically demanding and offers fabulous scenery and a fascinating insight into a rich culture and history.